Find Out the Benefits of Holding Physical Gold and Learn About Rollovers and Transfers Into Your Retirement Account. If you’ve ever wondered: What is a gold and silver IRA? Read on, this guide is meant especially for you and will cover the basics of what you need to learn about holding precious metals in your own IRA account for retirement purposes. Investing in precious metals such as gold, silver, and platinum and palladium is one of the best investment decisions you can make for your later years, especially during this period of economic uncertainty. Stocks and bonds are two of the riskiest investments as they are subjected to fluctuations due to inflation, wars, natural disasters, and several other conditions. Securing your future through a Gold Individual Retirement Account (IRA) allows you to harness the benefits of an IRA investment and the benefits investing in precious metals. Traditional IRA accounts may not provide the financial security you require for yourself and your loved ones. Locking down all your assets in an IRA or 401(k) account exposes you to the risk of losing your assets due to inflation and devaluation. It is important that you diversify your investment portfolio by investing precious metals in your Individual Retirement Account. However, just like any other investment, it is important to know the ins and outs of investing in precious metals IRAs and know the risks and benefits of using them for investing purposes. This guide will help the beginners who want to secure their investment in this manner. Why Should I Consider Precious Metals Investing? Since the dawn of time, silver, platinum, and gold have been considered valuable. Thousands of years have passed but the human fascination with precious metals remains as strong as ever. Even today, these valuables have their place in an intelligent investor’s portfolio because they are undeniably considered as a universal symbol of wealth and prosperity. However, in today’s uncertain economic conditions, there are several other reasons for investing in these valuable commodities. Precious metals serve the purpose of ‘wealth insurance’ in times of wars, political upheavals, and natural disasters. With the increasing terrorists’ attacks, natural disasters, and geopolitical tensions (think Ukraine, Syria, Iran, China, etc. ), it is important to keep yourself financially insured by investing in precious metals. Risk and profit go hand in hand, but precious metals are unlike any other high-yielding investment because of their profit potential and risk-free nature. The prices of precious metals continue to appreciate over the long haul because of increasing demand and diminishing stores. It is expected that by 2030, gold prices will almost be doubled. The US dollar and other currencies have fallen precipitously relative to precious metals over the last few years. In case of a stock market crash or financial instability, gold serves as a ‘crises commodity’ and remains unaffected by inflation or deflation. Metals such as gold and silver not only retain their intrinsic value in good and bad times, they also increase your purchasing power considerably. What is a Gold Individual Retirement Account? A Gold IRA is an IRS-approved depository of precious metals. It functions in the same way as a regular IRA, except that it holds physical coins or bars of precious metals instead of paper assets. Gold IRAs allow the individual to secure their assets in a tax-deferred account that holds relatively smaller risk as compared to the traditional IRAs. There are three main reasons why investment in physical gold bars or bullion can be a good idea. Investment Portfolio Diversification – Investing some proportion of your funds in physical gold helps you diversify your investment portfolio and protect your funds from adverse economic conditions. Hedge Against Inflation and Deflation – Unlike paper assets such as stocks, bonds, promissory notes, and currency, gold provides a hedge against inflation and deflation and helps you in protecting your overall financial position. Profit Opportunity – There is a reason why precious metals IRAs are called “investment.” Gold and silver demand and prices consistently grow and offer you an opportunity of earning profit over your investment. 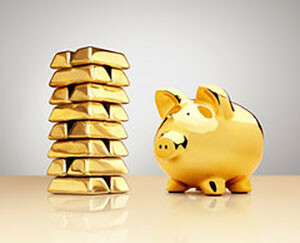 While there are many benefits of investing in a Gold IRA, there are certain issues that should be considered as well. It is important to know that holding an Individual Retirement Account (IRA) does not mean that you can automatically use it to stock your precious metal investments. Setting up an account requires a procedure to be followed and you may be charged a certain amount of money for this purpose. The law also requires you to store your assets in a facility that is approved and secure. As you may know, the list of precious metals allowed for a self-directed IRA is pretty short, namely: gold, silver, and platinum and palladium. Purchasing IRS-approved gold coins and bullion is the first step of IRA investing. In order to hold precious metals in an IRA, the user should ensure that their asset meets the fitness requirements set by the Internal Revenue Service (IRS). The regulations pertaining to investing in precious metals can be found in Cornell University re: Section 408(m)(3) of the IRS code. Failure to meet the requirements set by the IRS may subject the investment to certain taxes. Therefore, it is important to consult a investment professional to protect your investment from unnecessary taxes. Gold must be .9950 (24 karats) pure. Bullion bars should be fabricated by NYMEX, COMEX, or any other ISO 9000 approved refiner. Proof coins should be presented with a certificate of authenticity and must be in their original mint packaging. All bullion must be in an uncirculated, first-rate condition. You can invest in the above mentioned coins in specific sizes. One ounce, one half, one quarter, and one tenth ounce coins are allowed by the Internal Revenue Service. What Kind of Account is Needed to Invest in Gold? To invest in physical gold, an individual is required to setup a self-directed IRA. As the name implies, it is an account that offers complete control to the investor. With a self-directed IRA, the investment possibilities are unlimited. The account holder directs all the investment decisions and enjoys flexibility in choosing the investment opportunities. With a self-directed IRA, you enjoy all the investment opportunities available to the traditional IRA holders as well as freedom to purchase physical gold. A self-directed IRA is opened with a custodian that allows the owner to invest in precious metals and other traditional assets such as real estate, notes, tax lien certificates, etc. Physical gold such as bars and coins can be purchased through a self-directed gold IRA. However, there are minute and detailed specifications that should be taken care of. Because of complex gold IRA rules and regulations, the IRS has mandated it to get services of a custodian to hold and manage a self-directed IRA. A custodian is a company responsible for the management and security of your assets. A self-directed custodian can be a bank, credit union, brokerage firm, or savings and loan association that has been approved by the IRS. If you have answered a resounding “yes” to the question: “why buy gold“, and if you already hold an IRA, you will be required to ask your existing custodian about whether they offer you the flexibility to invest in physical gold. If not, you will be required to setup a new IRA and transfer your funds to the new account. Do You Need a Custodian to Handle Your Self-Directed Account? One of the most frequently asked questions by novice investors is whether they really need to get services of a custodian to handle their self-directed account. A simple answer to this question is yes because the IRS has mandated it to open a self-directed account with an approved custodian. There are other reasons as well. With greater freedom and flexibility comes greater responsibility and risks. An individual alone cannot properly manage and secure their assets by themselves; therefore, it is essential to seek assistance of a professional custodian for managing a self directed precious metals ira account. Trusting a company with your assets is an important decision; therefore, you should carefully consider all the factors that are important for choosing a self-directed custodian. You may look for the following factors to make the best possible decision. Licensure – Only IRS-approved self-directed custodians are allowed to hold and administer self-directed IRAs. The list of approved custodians is publicly available. Make sure that the custodian you choose in on that list. Specialization – Specialization is usually an indicative of expertise and quality of services. Look for a custodian that specializes in holding physical metals and managing Gold IRA accounts. It is important to know the strengths of your custodian and make sure that they complement your needs. Fees – The fee you are charged by a custodian can impact the total returns of your self-directed IRA. It is important to negotiate the fees beforehand to avoid any issues in the long run. The next step of the process is to know how to transfer your funds to a self-directed IRA. Individuals, who already hold an IRA, can easily invest in gold through direct transfer. If you hold any other plan such as 401(k), 457(b), 403(b), or a Thrift Savings Plan (TSF), you can easily convert them into a Gold IRA through a rollover process. When you’re considering Gold IRA investing, it is important to know the ins and outs of the process to choose the best possible solution, while incurring the least amount of cost through taxation. As discussed, an individual can invest in precious metals through direct transfer or rollover, depending on the type of account they hold. However, there are some differences between the two processes in terms of taxes charged and others rules and regulations. Direct transfer of an IRA is a tax-free process in which you simply move your IRA from one custodian to another. Since it is a tax-free process, you will not be required to report anything on your income tax return and you are permitted to perform as many transfers as you like. The rollover process allows you to transfer whole or some part of your funds into another qualified plan such as a Self-directed IRA. Whether you hold a 401(k) plan or a traditional or Roth IRA, you can easily transfer them into a suitable account through a rollover. There are no tax penalties whatsoever, provided you complete the process in 60 days. The process can be repeated once in every 12 months. One of the most important considerations for investing in a Gold IRA is to understand its tax implications. Investing in precious metals has many tax benefits over other types of investments such as real estate, stocks, bonds, etc., but one should know the precious metals IRA rules to get the most benefit from their investment. The major tax benefit of a precious metals IRA is that you are not required to pay tax on the gain in value of your assets when they are sold. You are only required to pay tax on withdrawal of the money generated from the sale of the gold. Generally speaking, Roth accounts particularly offer more tax benefits as compared to other types of IRAs. When you withdraw your funds by selling gold upon reaching the retirement age, you are not required to pay the normal collectible capital gain tax rate. This tax rate can be as high as 28 percent on the holdings kept outside an IRA. If you hold a Roth IRA that was opened five or more years back, you will not be required to pay any kind of tax on withdrawal at or after retirement. If you hold a traditional IRA, you will be required to pay tax on the withdrawn amount equivalent to the normal income tax rates. The tax implications for withdrawing your funds before reaching the retirement age are different. On premature withdrawal, one will be required to pay an additional 10 percent penalty tax on the amount they withdraw. However, there are certain exceptions such as disability, death, expense for higher education, etc. The IRS offers tax relaxation to individuals whose medical expenses exceed 10 percent of their income. The IRS also allows first time homebuyers to withdraw up to $10,000 from their IRA without paying any kind of taxes. Storage Options – Where are the assets are stored? Another question that is often asked by investors is who holds the physical possession of precious metals kept in a self-directed IRA? 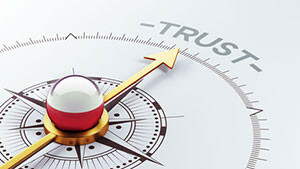 It’s very important to find a trusted custodian who can store your assets in a safe depository of your choice. If your custodian does not offer you the storage option of your choice, you can always rollover your funds to a different custodian who offers a broader range of storage options. Many custodians store their investors’ assets in private depositories, which have highly advanced security mechanisms and tools such as timed locks, 24 hours monitoring system, automatic relocking, and vibration, motion, and sound detectors. According to the IRS, gold and other precious metals should remain in the custody of an IRS-approved custodian until the funds are withdrawn on reaching the predefined age. There are two types of storage depositories – a segregated depository and a non-segregated depository. 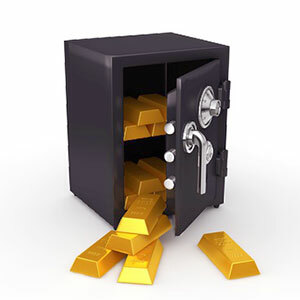 In a segregated or allocated depository, your coins and/or bullion are kept separately from other people’s assets. This type of storage option is available for gold bars of 10 ounce and greater. When you decide to withdraw your funds, you will receive the same bars that you had originally deposited. In a segregated depository, gold bars are identified by their serial number, refinery name, and size. In case of a non-segregated or unallocated depository, your gold will be mixed with the assets of others. However, you will receive the coin or bar of the same year that you had originally deposited. In an unallocated depository, bars are identified by their weight and refinery, and coins are identified by the type and year minted. Just like any other plan, there are certain rules for withdrawing gold from a self-directed IRA. It is important to know those laws in order to save yourself from facing any kind of tax penalties and to maximize returns on your investment. The rules and regulations are different on physical withdrawal of gold and on withdrawal of cash by liquidating the assets. An IRA custodian can liquidize the assets on receiving a distribution request by the investor. They are liquidated and cash is issued to the investor who is required to pay taxes at a predefined rate on the distribution of their gold IRA. Gold stored in an IRA is the property of an investor, and they can request the custodian for a physical receipt whenever they like. However, one must consider that they will be required to pay tax twice, first on the distribution of their IRA and second when they liquidize their gold to cash. To purchase bars and coins for investment in a self-directed IRA, you should first contribute some funds to your account. This can be done by directly transferring the fund or by rolling over your existing plan to your new self-directed IRA. With funds in your account, you can request the custodian to use your funds for purchasing from the selected dealer. The custodian buys gold on your behalf and delivers it to an approved segregated or non-segregated depository of your choice. Purchasing gold with a self-directed IRA is an excellent investment opportunity but it comes at the cost of buying gold that is priced slightly higher than the the commodities market. You may also be required to pay some additional charges such as purchasing transaction fees and shipping costs. Also, the custodian may charge you some extra amount for holding your assets. A gold backed IRA is one of the simplest and most secure ways of investing your money. It is profitable, safe, and yields good return in the longer run. However, it is a common assumption that investing in a precious metals IRA is a complicated and lengthy process. As a matter of fact, with the help of an experienced custodian and a reliable dealer, the process becomes quite simple and quick. The following 4-step process explains the whole procedure involved in investing a Gold IRA, from opening a self-directed account to buying gold from a dealer. The first step in investing is to open a self-directed IRA. The process of opening such an account involves nothing more complicated than completing an application. The new account is opened within two business days of receiving the application (sometimes faster with certain companies), depending on the custodian policies and procedures. The process is quite simple and quick if you are funding your new IRA by directly transferring the money through a wire transfer. On the other hand, if you are transferring your funds by a rollover, such as a 401k to gold ira rollover, or a direct transfer, you will be required to consult with your custodian to ensure that you complete all the necessary steps involved. Depending on the policies and procedures of your custodian, the process may take several days to weeks. Therefore, it is very important to consider the time spent here when planning an investment. Before purchasing from an approved dealer, the account holder must select a depository where their assets will be stored. Every custodian usually has a list of their affiliated storage depositories. However, a user can always move their funds to another custodian if they do not offer storage options of their choice. Once you have transferred your funds into your new Gold IRA, you can invest in bullion and coins from a reliable and IRS-approved dealer. This is a multi-step process and requires expert advice from an authentic IRS-approved consultant. Once you have selected a dealer and funded your account, you can buy gold from your selected dealer by placing an order. Dealer then contacts your custodian to verify the availability of funds in your account. Custodian contacts you to verify the order. Custodian then contacts the dealer and confirms the availability of funds and authenticity of the order. Dealer delivers the gold to your selected storage depository and funds are released to the dealer once the depository confirms the receipt of gold. On completion of these five steps, gold is attributed to your self directed account in a depository for safekeeping and you are ready to enjoy the benefits of investing in precious metals. In the last two decades, investing in Gold IRAs has gained immense popularity due to their stability against volatile market conditions. Many people invest in precious metals IRAs as a way to diversify their investment portfolio; others invest to enjoy the ROIs offered by precious metals. There are a number of benefits of owning a gold backed IRA. Let’s have a look at some of the fundamental advantages of investing in an individual retirement account. Economic instability weakens almost every type of investments except precious metals. Stocks, bonds, paper investments, and even real estate may see a decline in their market value in uncertain economic conditions. On the contrary, gold appreciates with time. Investing in a metals IRA is the best way to have a reliable source of income after you stop working. It does not devaluate with time and increases purchasing power of the investor. Gold IRA rollover holders enjoy more tax benefits as compared to other investors. These accounts are classified under income investments, which are tax-deferred. Therefore, the investor can accumulate their money by investing in year after year without paying taxes. The tax is only payable when the investment is liquidized into cash. Can I use my 401k to buy? An individual can invest in gold not only by opening a new self-directed IRA, they can also move their accounts such as 401(k) and other traditional IRAs to a gold-backed IRA. This helps you to diversify your investment portfolio and preserve your wealth in a secure manner. With a Gold IRA, an individual is rescued from the worry of losing their hard-earned money due to inflation and stock market crises. An IRA not only protects your investment from devaluation and other financial risks, it offers you amazing rewards in terms of a higher return on investment. The basic economics principle of demand and supply applies here. With time, the supply of gold has decreased but its demand continues to reach new heights, which makes your assets grow at a faster rate as compared to real estate and stocks. Various countries such as China and India have started stockpiling gold, which is expected to cause an increase in prices. Seasonal demand of gold on Christmas, Chinese New Year, Diwali, and Eid also results in an upsurge in demand and price. 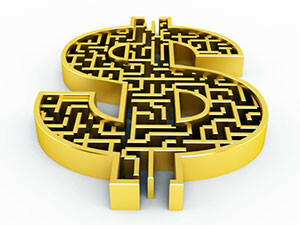 The fee structure of maintaining a retirement account such as 401(k) and traditional IRAs is often very complicated. Because of this reason, many people think twice before investing in a Gold IRA. As a matter fact, the cost of opening and maintaining an IRA is minimal compared to the profit it offers, and the process is quite simple. However, investing in this asset class is a business decision, which should only be taken after considering all the aspects of the process. Investment involves different parties, including the custodian, a storage depository, and the dealer. These three parties charge some amount to the investor for their services. Since a gold IRA rollover is a tax-deferred account, therefore, it must be opened with an IRS-approved custodian. The fees varies from custodian to custodian, but expect to pay around $50 when opening a new self-directed IRA or rolling over your existing funds to the new account. Once you have opened a self-directed IRA, you are ready to invest in coins and bullion. However, you will be required to pay a transaction fee every time you purchase or sell any of the assets. Again, the fee varies from custodian to custodian. $40 per transaction is a typical charge to conduct such a transaction. Custodians are responsible to protect your investment and take care of all the bookkeeping and account maintenance tasks. They charge you some amount on yearly basis, which may range from $75 to a few hundred bucks. The rate varies from custodian to custodian and most of the IRS-approved custodians disclose their fees on their websites. So, you can easily compare the rates and choose a custodian who charges the least amount. If you are an experienced investor with huge investments in your Gold IRA, you are likely to get discounts from the custodian. Whenever you buy from an authentic dealer using your IRA, your custodian is required to transfer the amount charged to the dealer through wire transfer. Each wire transfer may cost you around $25, but you can reduce this amount considerably by conducting fewer but bigger transactions. The gold you purchase from a dealer is kept in a storage depository that is responsible to keep it secured and segregated from other people’s assets. Expect to pay around 0.5 to 1 percent of the value of your assets to the storage depository every year. In addition to the value of gold, the fee charged by a storage depository also depends on its type and other features that it offers. A segregated depository is likely to charge you more as compared to a non-segregated depository. Your portfolio of precious metal assets also decides the amount you are charged by a storage depository. If your self-directed IRA account holds different types of precious metals, you are likely to be charged a higher amount by the storage depository. Whenever you buy coins, bullion and other precious metals from a dealer, you may be charged an extra fee by the dealer that is known as the spot price or dealer’s premium. It is based on various factors such as product type, dealer premium, and demand of the product. Dealer premium amount varies from dealer to dealer and their ability to buy mints directly from the government or private mint producers. Generally speaking, dealers charge an extra amount to cover the cost spent on insurance, shipping, marketing, storage, labor, and other services. How can I invest gold in an IRA? The process is quite simple. You start with opening a self-directed IRA with an approved custodian or by rolling over your existing retirement accounts. Once you have opened and funded your new IRA, you are ready to purchase gold from a dealer. How do I transfer fund from my retirement accounts to my Gold IRA? You can easily transfer your funds through a direct transfer or a rollover. Both are safe and tax-free. However, there is a set of rules which should be followed in order to avoid penalties. What type of retirement accounts can be transferred or rolled over to Gold IRAs? The accounts that can be rolled over to a Gold IRA include 401(k), 403(b), Thrift Savings Plan, pension plan, 457 deferred compensation plans, and other non-traditional IRA. For more information, contact an expert IRA custodian. Just like any other IRA, a precious metal IRA can only be opened with an IRS-approved custodian. Since this is a tax-deferred account, you will be required to get services of an approved custodian for precious metals IRA investment. What type of metals can I hold in my Gold IRA except gold? The investment opportunities are unlimited with a Gold IRA. Even though gold is the most popular type of investment, you can further diversify your investment portfolio by investing in silver, platinum, and palladium. However, you will be required to follow the precious metal fitness requirements set by IRS. How can I monitor the financial performance of my assets? You can always contact your IRA custodian to keep track of the performance of your Gold IRA. Your custodian is also responsible to provide you periodic statements about your investment’s portfolio performance. Can I take physical possession of my gold and other precious metal assets? As per the directions of IRS, your assets are kept secured in a storage depository in your name. However, you can withdraw the assets upon reaching the age limit set by the IRS without paying any penalties. The IRS also allows investors to withdraw their funds at any age after paying a certain amount. I heard that Gold IRAs are tax-deferred account. Is that true? Yes. Generally speaking, IRAs offer greater benefits in terms of their tax implications. The account holder is required to pay tax only when they liquidize their assets into cash. The tax implications depend on withdrawal time and other factors. Yes. You first transfer should be $5,000 or greater. The annual IRA contributions limit depends on your income level and types of account you hold. Take consultation from your custodian or an IRA specialist to determine your annual contribution limit. Can I contribute my existing gold to my new self-directed IRA? No. Except for a rollover or direct transfer, you will be required to make all contributions to your new self-directed IRA in cash. However, you can always use your funds present in a self-directed IRA to purchase precious metals, including coins and bullion. I heard that setting up a self-directed precious metal IRA is a complex and expensive process, is that true? Setting up a precious metal IRA is quite similar to setting up any traditional IRA. The only additional step is the rolling over process for transferring funds into your new IRA. Expect to pay around $200 to $275 for setting up a new self-directed IRA. Is my precious metal IRA only limited to precious metal investments? No. 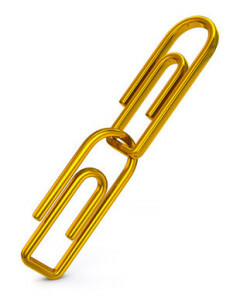 A precious metal IRA offers you unlimited investment opportunities. In addition to precious metals such as gold, silver, platinum, and palladium, you can also invest in stocks, treasury securities, bonds, etc. What are the basic eligibility requirements for investing in a Gold IRA? Just like any other traditional IRA, a Gold IRA can be opened by anyone under the age of 70 years who earns regular income from any kind of employment and can make annual contributions to their IRA. How do I choose the right IRA custodian? This step is very crucial and you must take care of all the considerations to avoid unnecessary risks and penalties. Always choose an IRS-approved custodian who has an understanding of the tax laws and an extensive experience of managing precious metal IRAs. How do I select the right storage depository for my assets? Your IRA custodian can help you in selecting the right depository for storing your coins and bullion. Generally speaking, you should consider the following factors when choosing a storage depository. Security mechanisms in place such as automatic relocking, CCTV monitoring, timed locks, detectors, etc. Can I take my distributions in the form of physical gold instead of liquidizing them to cash? Yes. You can always opt for cash or non-cash distributions. However, the distribution will be taxable, which means that you will be required to either liquidize the gold to pay taxes or to pay taxes from your personal accounts. Also, do not forget to consider the tax implications on cash and non-cash withdrawals. Information on this page is intended for entertainment purposes only. Iragoldadvisor.com and its editors recommend you seek professional investing advice before undertaking any financial transaction.